Explore the third most visited museum in the world with a shared tour in English! Make the choice to visit the Louvre Museum and the marvellous collection of art works contained inside in the company of a local guide who speaks your language. Skip the queue on arrival and make the most of this experience with a guided tour for a maximum of 20 people. The English language tours are available every day except on Tuesdays. Admire the vast collection inside one of the largest and most visited museums in the world without missing out on a single amazing detail. Admire Leonardo da Vinci's la Gioconda, the Venus de Milo, Psyche Revived by Cupid's Kiss by Canova and more than 35,000 other works of art which are housed in this world famous museum. Once the guided tour has finished, you are able to wander around the museum freely, admiring the other works of art for as long as you like. 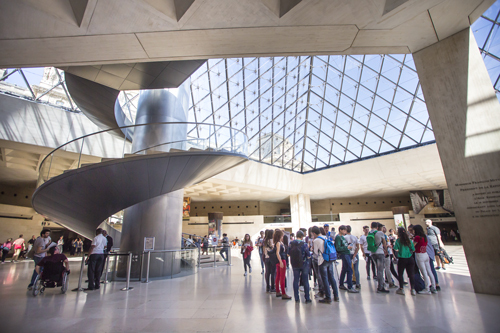 Thanks to the priorty access, which means being able to skip the queue at the entrance, you can go straight into the museum and enjoy the pleasant company of your guide from the start of your visit to one of the largest museums in the world, the Louvre. Get ready for a journey into history where you will travel through different eras and cultures in a vast space that contains more than 35,000 works of art that are just waiting to be seen by you. You will be able to move around the museum with ease as it can be more complicated trying to do this without the assistance of a guide who will be able to show you the best and most important works. If you have opted for a guided tour, you will be able to pass from one collection to another quickly and easily with the certainty that you won't miss out on any of the most iconic works. This tour focuses on the most famous works such as: The Mona Lisa, which was painted by Leonardo da Vinci in 1506, the Venus de Milo, a Greek sculpture of the Goddess Aphrodite and the gigantic picture of Napoléon's Coronation which is a work by Jacques-Louis David. You will be amazed and captivated by the stories behind the Louvre's most important artworks. At the end of the tour, you can spend as much time as you like in the museum, perhaps whilst using our suggested itineraries on the web page: The Louvre Museum. Availability every day by reservation (except Tuesday).